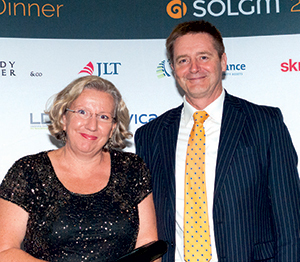 The recent McGredy Winder 2015 SOLGM Local Government Excellence Awards celebrate some of the sector’s best-managed projects. 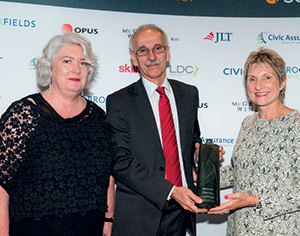 Selwyn District Council’s Project Helix, which led to the creation of an end-to-end online building consenting system, takes home the supreme award at the 2015 McGredy Winder SOLGM Local Government Excellence Awards. Judges praise it as “an outstanding example of the local government sector’s ability to develop and implement solutions at a national level”. 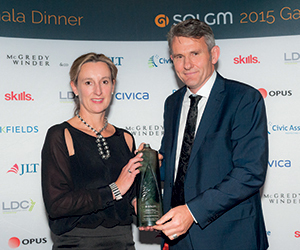 Selwyn District Council received the award at SOLGM’s inaugural gala dinner in Wellington recently. All entries were judged on a range of criteria including the strategic context within which the work was done, project and relationship management, continuous improvement and the ultimate success of the project. Ian Butler, Vanessa Beavon, David Ward & Keith Smith (all from Selwyn District Council). WINNER: Selwyn District Council’s Project Helix. Project Helix led to the development of an end-to-end, cloud-based building consenting system in partnership with the private sector. THE JUDGES SAID: This tool was developed at a time of unprecedented demand and has transformed the way building consenting can be delivered. Project Helix has already demonstrated it is applicable to the sector as a whole. The approach taken here should also serve as an example to central government regarding the sector’s capacity to develop and implement solutions to a nationwide issue. Anne Columbus (Christchurch City Council) & Don Chittock (Environment Canterbury). WINNER: Environment Canterbury on behalf of the Combined Health and Environmental Risks Programme Control Group: Canterbury’s Waste and Environmental Management Team (WEMT). The WEMT is a cross-governmental approach to proactively managing the major environmental risks created by disposal of 8.75 million tonnes of earthquake-related waste. The WEMT initially involved Environment Canterbury, CERA, and the Christchurch, Selwyn and Waimakariri councils. It is understood that membership has expanded since. THE JUDGES SAID: The WEMT approach is an impressive demonstration of the power that sharing information, flexibility and openness can bring to solving large-scale issues. We note the model’s wider applicability to regulatory, monitoring and waste management. WINNER: National Environmental Monitoring Standards – submitted by Auckland Council on behalf of the NEMS Group. For decades there has been a growing divergence throughout the country on how environmental measurements are taken. This arose through a lack of common measurement standards and a lack of consensus on what constitutes best-practice monitoring. NEMS has produced national standards, best practice to achieve standards, and the documents to support them. This enables comparable, quality data, and standard practice for reporting. NEMS is an initiative generated by local government working in conjunction with agencies such as NIWA and the Ministry for the Environment. NEMS has received international recognition as a world first – in that monitoring standards in other countries are developed by central government and imposed on other levels of government. THE JUDGES SAID: Water and water quality are significant national policy issues. The development of these standards is an extremely successful cross-governmental approach to developing environmental standards that, to date, is unique and has been internationally recognised. We are impressed by the steps the group has taken to promote use of the standards and develop sector understanding. NEMS’ work is a great exemplar of capability building at the system level. This entry also represents an exemplar of the continuous improvement ethos. Judy Campbell & Barry Vryenhoek (Gisborne District Council). 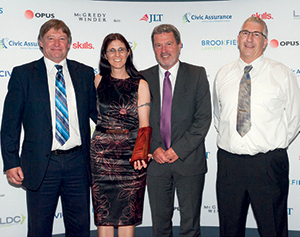 WINNER: Gisborne District Council – Gigatown. Gisborne District was an entrant in the Gigatown competition – eventually finishing second to Dunedin. This entry describes how Gisborne was able to mobilise its community through the Gigatown project to the extent that it came close to surpassing another competitor that was several times its size. As importantly, it describes how council and the community have used the relationships built to make gains in other areas. THE JUDGES SAID: This is an exemplar for its engagement with groups with which it can be difficult to engage, and for its ability to harness these relationships to gain momentum in areas such as economic development and education. This entry demonstrates the importance of setting challenging goals, managing a project successfully and being prepared to go to the grassroots. Linda O’Reilly (Brookfields Lawyers), Ghassan Basheer & Clare Crickett (both from Waikato Regional Council). WINNER: Tui Mine Remediation – Waikato Regional Council. Media have historically referred to the Tui Mine near Te Aroha, its nearby tailings dam, and two nearby streams as “New Zealand’s most contaminated site”. The remediation is understood to be the first of its kind in New Zealand and took around 160,000 hours to plan, manage and deliver. The project has cleaned up the streams to the extent that aquatic life is returning and the two streams should be safe for swimming within 15 years. THE JUDGES SAID: This is a meticulously-planned and executed approach to a multi-year, multimillion-dollar project involving multiple delivery agents, stakeholders and risk factors. The collaborative and phased approach to the remediation provides lessons for others facing legacy issues of this nature. Both Peter Winder and Lyn Provost declared conflicts of interest in, and did not mark, the two entries from Kaipara District Council. Peter also declared a conflict of interest in, and did not mark, the entry from Queenstown Lakes District Council.